At an Alberta Assembly of Treaty Chiefs meeting many Treaty Nations have stated their opposition to Canada's proposed Indigenous Rights and Recognition Framework Legislation. We are Treaty Tribes, Nations and Peoples of Treaty No. 6 (1876 and adhesions thereto), Treaty No. 8 and Tsuu T'ina, Treaty No. 7. Several Treaty Chiefs have sent letters to Prime Minister Justin Trudeau to ensure that the positions of Treaty Nations is on record regarding rejection of Canada's Proposed Indigenous Rights Recognition and Implementation Framework. The letters are in response to Minister Carolyn Bennett's public message, "No stopping the framework, says Minister Bennett, but she's listening (October 29, 2018)." "The First Nations have made it known publicly and in writing that Canada's aggressive agenda to expedite plans to create legislation designed to deny our rights to lands and resources have been done all without our Free Prior and Informed Consent (FPIC). This does not bring Honour to the Crown," Chief Craig Makinaw. "Our sacred treaty matters were not addressed – instead the Minister in July of 2018 sent out a form letter that completely mischaracterized the process and did not include one word on the treaty issues raised in our letter. Onion Lake was not the only Nation to send a letter against the process. Canada has chosen to ignore those letters resorting to fabrications," stated Okimaw Henry Lewis. There was an expedited engagement period for the Framework process, and the results contained in the roll-up documents were selective in nature, supporting only Canada's pre-determined positions and goals and were dispensed only at federally pre-selected and managed meetings, and not released to our Nations. Chief Kurt Burnstick has stated: "As Treaty Peoples, Canada always must bring the honour of the Crown into dealings with our Nations. The present process is full of sharp dealings that bring no honour to either the Crown or the state of Canada." 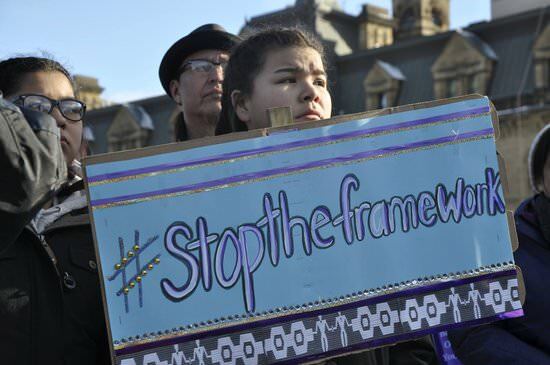 "The Framework is in direct conflict with our Treaty, inherent rights and title. The process does not recognize nor respect our jurisdiction," stated Chief Tony Alexis. Since 'Canada's Emerging Indigenous Rights' Framework' is largely based on 'fraud, treason and genocide', it's probably best to post this here. A book that will help to put things right amidst so much that is wrong. this could go in the legal marijuana thread too. put it here though because it was a given FN would get involved. i hope it incorporates back into our7 culture now. "When we say 'chief and council' we mean 'colonization'." Canada needs to hear this. Just over 500 Indigenous people from communities all across Ontario came together to hear the youth, speakers, Chiefs, and many others to say in one voice to Stop The Framework. ..a good overview of the framework and the current state of affairs. "Stuart Myiow, Wolf Clan representative of the Mohawk Traditional Council, says Western 'democracies' wrongly prioritize individual rights over the rights of the collective."